In this article i will be demonstrating and exploring new Razor View Engine introduced for ASP.net MVC3 framework. The article as some code snippet to learn Razor syntax quickly and easy manner. We will deep dive into some common used syntax in MVC view pages. Recently I decided to have some hands on ASP.net MVC. There are few good articles to start on ASP.net MVC and know why & where to use ASP.net MVC model. After stepping into the MVC model I reached to the point where we need to decorate Views. Views are user facing in form of UI (User Interface). Passing data from the Controller to a View. User does not know what you are doing at back end (Controller or Model), but only the UI. In ASP.net MVC 1 & 2, MVC has relied on the standard ASP.net View Engine, which depends on the ASP.net block . This is common in your ASP.net development if you want to access any server side data on your ASPX page. In ASP.net MVC 3, the new Engine has been introduced called Razor View Engine which replaced the standard block with @ character. The new Engine is quite easy and faster than the old view engine. "The .cshtml file extension denotes a C# view that will be processed by Razor. Previous versions of MVC relied on the ASPX view engine, for which view files have the .aspx extension." To demonstrate the Razor View Engine in MVC, let's create a small ASP.net MVC project. You can use Visual Studio 2010 or latest 2012 to create a new project. Let's build the simple Employee information ASP.net MVC Project. 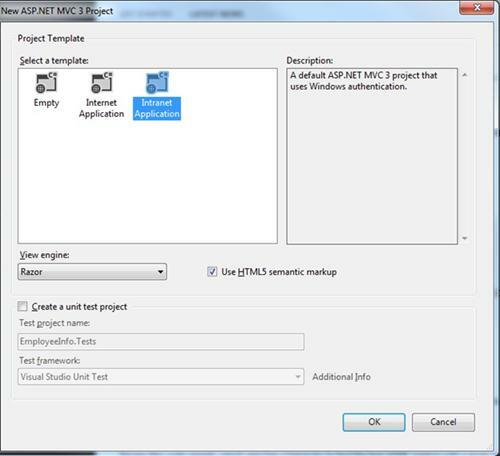 Create a new Project & choose the ASP.net MVC 3 template from the Visual Studio as shown below in Figure 1. Visual Studio will prompt for Project Template as shown in Figure 2. We will take the Intranet Application and Choose the View Engine as Razor as shown in Figure 2. Intranet Application has some start up Controllers and Views to build the starting project. Let's create a model class called "Employee" which will hold our Employee information data for us. Now let's define the controller class which will communicate to the model class defined above. We will create an empty controller to demonstrate it simple and easy to learn about Razor for now. We are going to initialize our Model (Employee) in our controller for simplicity. Sample is shown in below listing. As you can see we have created two main part of MVC i.e. Model and Controller. We are going to focus on Razor so will not go deep into Model and Controller for now. Now to understand more how to use Razor Syntax, we will create a View for the above Controller. The controller is storing some data to model and passing the model employee to the view. As you can see in our controller, the action is Index which will have the corresponding view "Index.cshtml" as per the convention. Note: You need to compile your project to use the strongly typed view otherwise you will not see your model in your Model Class dropdown option. Once you add the View it will create an empty view with few lines as shown in below listing. As you can see it has some Razor syntax let see what is that all about? First line is interesting here @model EmployeeInfo.Models.Employee, it uses the Razor syntax i.e. @ to tell that View about the Model which we have created earlier which we can use in rest of the View. We can use the properties, methods and fields define in Model using @Model. Above we use the @Model.propertyName which get the property value define in the Employee Model. Let's have some C# code in your view, let's do it. Here we used If block with Razor syntax and View engine is smart enough to know what needs to rendered as the HTML block which we define inside the If condition. In above sample code things looks good for now. What if we change the HTML text like below where the HTML Text is start without any Tag? You will get some error on page when you run the application. Now you have got good idea and familiar with Razor Syntax and its use. It's not only you can use any conditional statements but you can use any C# code like loops, functions, and calling any existing C# objects like displaying DateTime etc. Now let's take one step further and see how we can deal with IEnumerable data pass from controller to view. I am going to modify the controller to have List of Employees and pass that list object to view and we will see how we can iterate the employee from that List in view. Modified Controller is listed below. We are telling View here that iterate the IEnumerable employee Model as you can notice in line 2. To iterate the model we are using foreach loop and displaying Employee ID. Hope this will help to understand about the Razor View Engine and Razor Syntax.